After food, clothing and shelter, safety is an essential part of life. Home is associated with safety; it is a place where one feels secure no matter what, a place of warmth and love. From the Vedic times till today, if one thinks of a safe place other than home it is the school. Schools are places where children are moulded, nurtured and taught values and life skills. A child should feel safe and secure to be happy to learn. Thus, a conducive learning environment must be provided to children to help them perform well not only in academics but in life too. However, of late, this safety has been missing. Take the brutal murder of Pradhyuman in a high profile school in Gurugram. How often these days do we read of abuse, negligence, corporal punishments in schools? Where are we heading to? The safety of any developing country rests in the security of its children. It’s time for us to look for remedies before these problems escalate even further. Agitations and petitions to district administrations are not the solutions. We have to look within the framework of schools and search for answers. We have to ensure that these sacred places remain free of fear and not become ghettos of crime. At the lowest level is physical safety. Wherever one is whether at home, on the street or in school one has to pay attention to one’s safety. Emotional safety is another parameter. Today even very young children have bottled up emotions. They are not able to express the cause of their pain or hurt. Who or what is troubling them, what situations or people instill fear in them… the list is endless. Emotional stress needs to be released so that children feel safe, secure and wanted. Ensuring emotional safety is a challenge for the teachers, educationists and counsellors. With the changing times and changing needs, the disintegration of the joint family and now with even nuclear families breaking up, who can a child speak to and be understood? How can we instill confidence in the child so that his personality doesn’t get distorted or subdued and suppressed? Schools have this great responsibility upon them. One thing is for certain, there can never be a foolproof system, but through simple ways and means we can make an effort to keep the portals of learning safe. We can begin by hiring more female staff in schools. Teachers (at least in the urban centres) are usually women. Apart from teachers we also need female maids, peons, sweepers and security guards. The staff and students must be sensitized to recognize any untoward movements in and around the school and report it to authorities concerned. Another important step is to educate children about good touch and bad touch. Through graphics, animations, pictures, photos and videos it ought to be explained. We must accept that the problem exists and we have to seek remedies to make schools a safe place. Further, when a child confides in us whether in the class or outside we should not make her feel as if she was the culprit. If the teachers are vigilant, any visible sign in the child’s behaviour or performance or the expression on her face should compel the teacher to delve into the crux of the matter. CCTV cameras are not always a solution. They cannot guarantee security. Furthermore, how many cameras can a person man? How many people should be hired for round the clock observation? Then there is the chance of human error and negligence. Buddy systems must be introduced. Children should never be alone in the school premises. Every child must have a buddy accompanying him/her. The habit of being together must be inculcated in the children from a very young age. The buddy system can also help children in their academics, in dealing with their self-esteem and other issues. Predators come in different forms and sizes and are finding newer ways to reach children. The Internet is the latest and easiest medium. Predators/pedophiles make friends with children on social networking sites and lure them. Fast moving lifestyles, nuclear and broken families and working parents means that children become easy targets. Parents, teachers and educators must enlighten the students about these faceless predators. Parents must find the time to talk to their children, or rather listen to them. We have to educate our children about virtual friendships. We have to monitor the sites they visit and know whom they interact with. Unless we keep a regular check we may be left feeling sorry all through our lives blaming ourselves with the hackneyed phrase … if only I had been careful, this tragedy could have been averted. Cyber bullying is to be shared with parents immediately and a complaint ought to be lodged. Suffering in silence makes the matter worse. Isn’t it shocking to learn that so many children have fallen prey to such predatory games as the Blue Whale Challenge? The age-old adage stands tall and true, “safety begins at home”. In the 21st century we are dealing with psychopath criminals and suicide bombers and the sad part is that they appear no different from ordinary people. The greatest challenge for the police and parents is identifying these monsters. It is difficult to monitor Internet access in schools where there are 50 to 60 students in a class. The schools have to devise ways and means to ensure that the students don’t go astray during computer classes. At home, it’s the parents’ responsibility to keep a check. 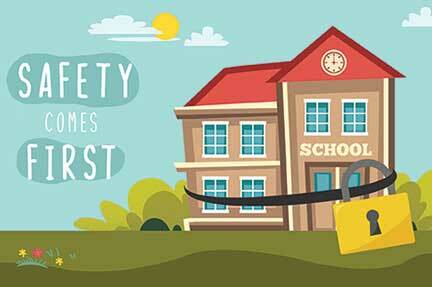 Schools must also address building safety concerns. In case a railing on the first floor is broken, it should be immediately taken care of. Or the place must be cordoned off until repair work is completed. A little concern would keep everything in place and a little negligence could not only cost us dear but a heavy price too may have to be paid. Schools must take into account the whole school premises from the safety point of view. In schools there are some vulnerable areas where authorities have to be cautious – washrooms, the terrace, perimeters of the school grounds if left unfenced. A parapet wall of the top floor might have caved in, here and there. A slight crack at one place might become a cause of bigger concern. The railings of staircases must be checked periodically; students have a tendency of sliding on these and that could lead to mishaps. In the rainy seasons, electrical switches might cause short circuits. Broken electrical boards and switches must be replaced immediately. School auditoriums are used during rehearsals and functions. Practice sessions are usually held at odd hours. This issue must be carefully addressed. Washrooms around these areas are used only during these times, one might miss out on the lights around these places. After all it’s better to be safe than sorry. At times construction and repair works happen even when classes are ongoing. Sharp edged tools and iron bars might be left behind carelessly. It is imperative we do a psychological profiling of the people we hire. There is no harm in monitoring their interactions on social networking sites. Whosoever is working in the school must be a bonafide worker; he/she must be hired after proper police verification. The antecedents of the people working in the school must be known and properly documented. Parent Teacher Associations: PTAs should not simply be on paper. There must be regular meetings and various security and safety concerns must be deliberated and action must be taken. Students should be informed about whom to contact during an emergency. In open house sessions, the principal and teachers must interact and specifically ask the question, “Where in the school do students fear to go and why?” and work doggedly to find answers to this question and implement the solutions. Alarm and fire safety drills: Fire safety mock drills should be conducted regularly in schools and exit plans pasted in the whole campus. Which exit route to be taken should be planned and placed on record. 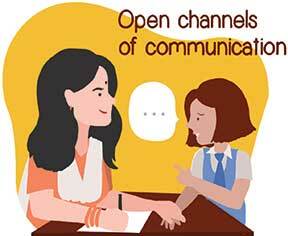 Open channels of communication: Problems arise when we stop speaking and stop listening. The problem today is there are very few real conversations. Whether it be at home where both the parents are working or school where the teachers are loaded with syllabus completion or other academic activities. Regular open house sessions will help the students open up and issues which no one might have known about may crop up. Whether it be bullies or someone harassing someone could be checked and addressed. No statement by the student should be trivialized or ridiculed. These are usually warning signs. Counsellors: Schools must take this mandatory step to appoint counsellors. With this new set of predicaments and stress which the millennials are handling we need highly skilled counsellors. Mail box at the water well: At times certain students are unable to open up or are too scared to complain against bullies or speak about harassment. To continue with various lines and channels of communications, a locked mailbox must be placed near the water cooler. Safety is a grave concern and the schools have to impart and inculcate this trait among the students – in its premises as well as outside. When it comes to the safety of a child, it is not only physical safety but psychological and emotional safety also which needs to be considered. If the child is safe, he will be well balanced emotionally and physically which in turn will lead to a healthy and safe society where violence, sexual and drug abuse will become a thing of the past and we will be able to see our childhood in our future generation, enjoying their childhood in a relaxed and carefree environment. A little care, a little observation, a little concern will keep the crisis and tragedy at bay. Let us join our hands together and pool in our efforts so that we give our children a secure atmosphere so that they may grow and bloom and become confident global citizens of the 21st century. The author has been a teacher for the past 25 years. He is currently working as T.G.T. English at Birla Public School, Pilani. He can be reached at chandraguptabps@gmail.com. How safe are our children in school?